Rachel Von | The Journal Gazette Leo's Kyler Bayes works on stopping the puck before the start of the first period of the Columbus vs. Leo hockey game at SportONE Parkview Icehouse on Saturday. Rachel Von | The Journal Gazette Leo's Grayson Goins shoots the puck during the second period of the Columbus vs. Leo hockey game at SportONE Parkview Icehouse on Saturday. 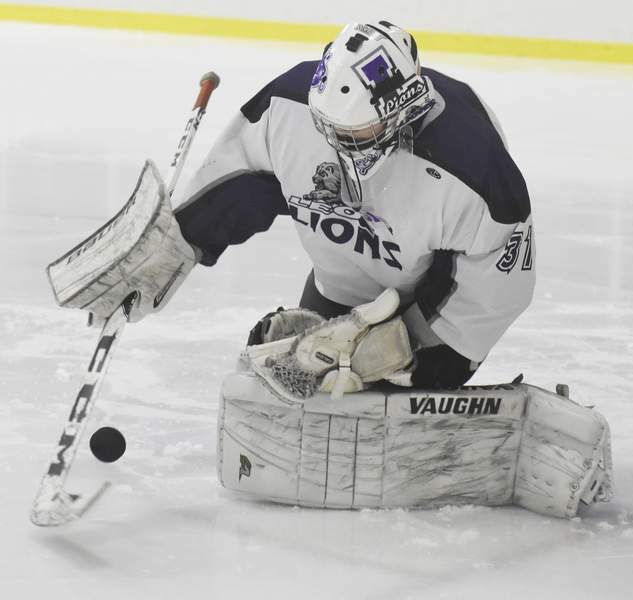 The good news for the Leo hockey team is they have only three seniors – goaltender Michael Baumert, defenseman Ryan Freeby and forward Ben Speckhard – so the cupboard is full moving forward despite a 4-0 loss to the Columbus Icemen in the Class 2A state championship hockey game at the SportONE/Parkview Icehouse on Saturday. 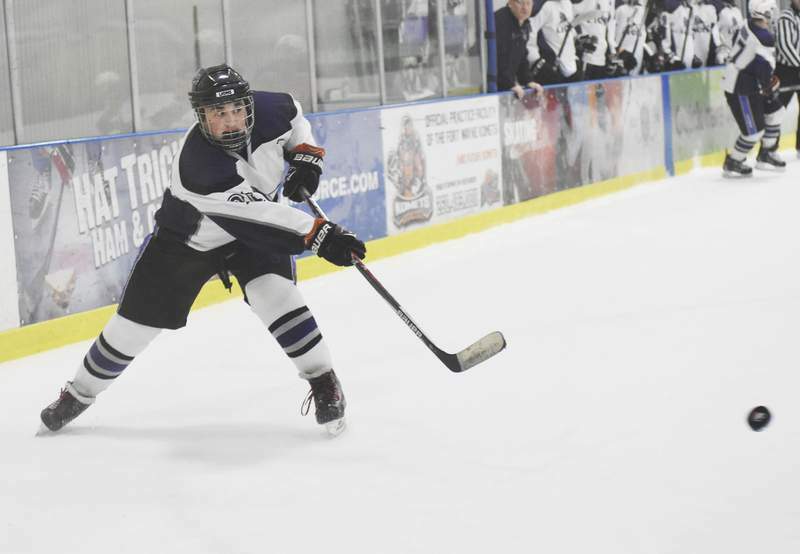 But for this young team, which includes playmakers Lucas and Logan Robins and Carter Bonecutter, it will be a long offseason to think about a game in which they faced a backup goalie, Cam Stattenfield, yet couldn’t get the offense going. Stattenfield stopped 14 shots as teammate Evan Kuzman served a one-game suspension. The Icemen (19-19-4) only totaled 24 shots on goal but maintained possession of the puck to keep the Lions (24-17-2) on their heels and quiet their fans, negating Leo’s home-ice advantage. “I think some of it was (us being tight) and we also sat back in the first period, let them take it to us, so we just weren’t ready,” Leo coach Doug Bonecutter said. The first-period goal came from Matt Jordan, who redirected a Darrien Nickerson shot, and in the second period a Mark Mayhew goal was followed by a Sean Thomasson shot from the right circle that reached the far side of the net for a 3-0 lead. At that point, Leo goaltender Kyler Bayes, who stopped 10 of 13 shots, was replaced by Baumert, who stopped 10 of 11. He allowed a power-play goal in the third period to Mayhew off a rebound. Notes: Fort Wayne’s Josh Scott received the Roy Chin Memorial Award, which honors referees and is named after a longtime Fort Wayne official. … Inducted into the Indiana State High School Hockey Association’s Hall of Fame were two people with local ties – Ron Bulloch and Mike McNeill. Bulloch was a president and coaching director with Fort Wayne youth and high school hockey, and he was on the committee that oversaw the renovation of McMillen Ice Arena. McNeill, who played for the Fort Wayne Komets in the International Hockey League, has been heavily involved in South Bend’s youth hockey.